Where does soil come from? In keeping with the big-picture perspective of this series, let’s tackle that question from the god’s-eye perspective. We can zero in on the finer points later. The minerals and other matter in soil have been around since the Big Bang and shortly thereafter. How and where those elements were formed is important. That dictates to a large extent their properties: what they can do, what they bond with, whether they are solid or liquid, metal or non-metallic, conductive, magnetic, reactive, inert, important in life’s processes or not and just how so. And that in turn, largely determines how an element behaves in soil, in plants, and in your body. So I’m not beginning at the very beginning just to be psychedelically cosmic; it’s a crucial part of the soil story. All the chemical elements except an evanescent handful of human-made ones were forged in one of three long-ago settings. The lightest elements, beginning with hydrogen, appeared in first few micro-moments of the Big Bang. A set of middleweight elements were fused later in the interior of early stars, and the heavier atoms were smashed together from lighter ones in massive stellar explosions called supernovae. The scheme posed by most current models of the early universe goes like this: Roughly 13.8 billion years ago the universe was infinitely dense matter at an infinitely high temperature in a state called the singularity, in which the laws of physics as we know them didn’t exist. Time, distance, velocity, light, gravity—none of these existed. I don’t think the human mind can conceive of what this was like. As you can imagine, this state isn’t exactly stable, and everything everywhere exploded and expanded. In the first few seconds of its existence, our universe went through myriad, utterly transformative shifts in which its fundamental properties repeatedly altered, as if someone were madly and completely rewriting the laws of physics many times a second. The earliest describable state of our universe was something called the quark-gluon plasma. Quarks are among the smallest and most basic particles known. The subunits of the atom, such as protons and neutrons, are made of quarks. Gluons can be thought of as glue-like entities that bind quarks together into the atomic subunits. But temperatures and densities in that early stage were so unimaginably high that no stable atomic particles could form. Any nascent protons or other multi-quark particles that arose were instantly torn apart and annihilated by the immense energies blasting them, as if a cosmic blowtorch were stripping apart the fabric of the universe. This quark–gluon plasma lasted only a few microseconds, but because all matter at that time was moving at so-called relativistic speeds—a substantial fraction of the speed of light—a few milliseconds was a vast expanse of time. The temperature of this particle soup was about 100 billion degrees Centigrade and it was about four billion times more dense than water. Those numbers are not really comprehensible; there’s nothing to compare them to. During these few microseconds, the laws of physics—the elemental constants and properties of the universe such as gravity and the second law of thermodynamics—began to settle down into the ones that rule all events today. It’s mere chance that we have the natural laws that we do. If the events of those first few micro-moments had broken slightly differently, this would be a completely different universe, where pi was perhaps equal to 10, or was constantly changing. This rapidly expanding universe cooled quickly. At roughly one millionth of a second into the Big Bang, temperatures had dropped enough—to about a billion degrees—for quarks to condense into the first stable protons and neutrons, much the way cooling steam condenses into droplets of water. But the universe still raged with enough energy to continually rip apart these particles, so protons, neutrons, and other sub-atomic particles came and went in dizzyingly unstable fashion. A very long time later, when the universe was all of ten seconds old, temperatures had cooled to where particles were no longer being blasted apart as fast as they came together, and the first true elements formed. These were hydrogen and helium. Hydrogen is made of just two particles: a single proton circled by a lone electron. Helium is a nucleus of two protons and two neutrons orbited by two electrons. These two elements, the lightest there are, make up 98% of the matter in the universe. Occasionally two atoms of helium would smack together in the cosmic forge, creating tiny amounts of the next-lightest elements, lithium and beryllium. Those four elements—but mostly hydrogen and helium—were all there was. By the time the universe was 20 minutes old, continuing expansion and cooling brought this era of nucleosynthesis to an end. Energy was now too diffuse to smash particles together, and new matter stopped forming for quite some time. For about 200 million years, the universe must have been very boring: nothing but an undifferentiated, featureless cloud of helium and hydrogen in their various isotopes, slowly swirling. But all that hydrogen and helium was doing something very important. In some places, matter randomly drifted into slightly more dense patches, forming vast ripples. Gravity accelerated this process of accretion, tugging the atoms and particles in these titanic ripples toward each other, compressing and heating them. If these gas ripples were big enough—thousands to millions of times the mass of our sun—they went through something called gravitational collapse, crunching down more and more densely, and then shattering into huge rotating chunks, each as massive as a large star. As they spun and continued to collapse, the heat and density of these proto-stars became so immense that they ignited into giant nuclear fusion reactors. These, the first stars, appeared roughly 100 to 200 million years after the Big Bang. Under their hellish conditions, hydrogen, helium, and subatomic particles in the stellar cores were smashed together into novel, heavier elements. This new way of forging atomic nuclei, called stellar nucleosynthesis, populated our universe with an array of elements, opening huge realms of possibilities for novelty. This boost in diversity fed an explosion in the ways that matter could combine. Suddenly a whole lot more could happen in the universe. 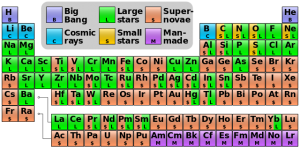 Elements birthed within stars include lithium, carbon, nitrogen, oxygen, sodium, magnesium, aluminum, silicon, phosphorus, sulfur, potassium, calcium, manganese, iron, copper, zinc, and several more. See Figure 1 for the complete list. 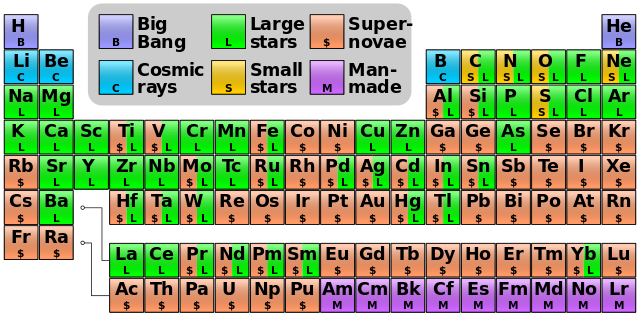 As you can see, many of the elements essential for life are created inside stars. Now we had carbon, the backbone of all living things, as well as the classic fertilizer elements nitrogen, phosphorus, and potassium. Calcium and magnesium were on stage, as were several major trace elements. Many of the basic building blocks of life were built inside these stellar furnaces. Figure 1: Where were the elements formed? The next stage in our story was a happy stacking of functions that helped make life possible. Although those life-friendly elements now existed, they were locked deep inside stars, which is not the optimal place for life and other complex systems as we know them to arise. How did the elements escape stellar cores and end up in places where life could form? The answer is, by some of the most violent acts in the universe. Many early stars were giants, hundreds or thousands of times the mass of our sun. Stars that huge are often unstable and have short lifetimes compared to smaller stars, as little as a few million years. Their most common fate is to collapse and then explode into supernovae, blasting their contents into space. And, to add to the useful functions of supernovae, as stars explode, their temperatures and pressures surge high enough to fuse their constituents into a new set of heavy elements. These include cobalt, nickel, molybdenum, iodine, gold, lead, and many more. These can’t form at the energy levels found in stars; they need the mind-boggling conditions found in supernovae. One supernova can emit as much energy as all the stars of a typical galaxy. Supernovae, destructive as they are, play a critical role in making life possible in this universe. They build new elements, and, by strewing their contents over light-years, put these and many other elements into play. At that point, the actors in the theater of life and soil are in costume and waiting to go on stage. In the next installment, we’ll look at who these actors are, what they do, and why their synergizing roles let them put on such a great show. 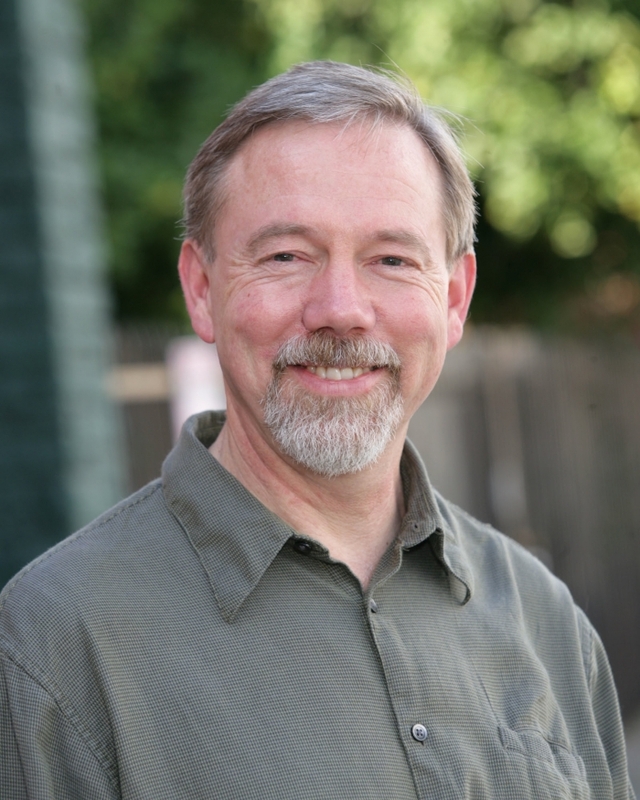 We’ll also see how the stage and scenery of the story of soil was built—in other words, how life came to be, why it was nearly inevitable that life arose, and how soil in many ways re-creates the conditions under which life formed. Thanks, Toby. Talking about starting at the beginning of a story! I have never put together the stellar evolution with the origin of soil. You are a deep thinker indeed. Incredibly interesting! I could read a whole book on the connections between stars and soil, what a great read, entertaining and informative! Fantastic! Hi Tony. Great read! When you say that hydrogen and helium make up 98% of the universe, would that include so-called dark matter ? Thank you Toby. Nice start to the story of soil. I’m mildly hopeful that you will have some of the recently revised history of the Austrailian aboriginal peoples performing agriculture seemingly 32K years ago and the carbon heavy soils of the Amazon Rain Forest, the food forests of Mayians and Aztecs and their early agricultural fields that current scholars seem to fail to recognize. We seemingly have significantly more evidence of those cultures early forays in the food production arts. Also, I’ve not heard much yet in permaculture about the nutritional value of clays, such as the sweet red clays eaten during the depression years. And finally, I once saw a documentary that directly linked beer with the creation and development of civilization. It would be kind of cool if you were familiar with that argument as well. All these may perhaps be too far out on the fringe of acceptable consideration for your purposes here, but interesting side notes that increase the diversity of our understanding of how soils provide nourishment, medicine, fun, and spirituality. Thanks, Rojer. I hope to mention most of the findings that you mention (I’ve always loved the connection between beer and civilization), and if I can make the story unfold in a way that makes for a good transition, I will. Especially the terra preta soils. That’s not fringe at all. I’ve been on land that was used by the ancient Maya (and is now by their descendants) and the soils are deep, black, and carbon-rich still. 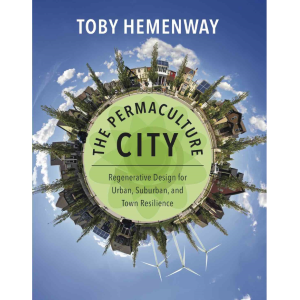 I love the way Toby made the cosmos approachable and inviting via the living ecosystem underfoot and brought the planetary scale compost heap of life to light. It reminds me of Henry Miller’s observation, “The moment one gives close attention to any thing, even a blade of grass it becomes a mysterious, awesome, indescribably magnificent world in itself. Pattern recognition is on full display as these bio signatures of elemental recombination are consistently exhibited throughout the biosphere. From ubiquitous microbial partnerships and communities to the corpuscles of sunlight energy that power photosynthesis to the charismatic megafauna and keystone species that define landscapes. As the 6th mass extinction event is underway, the Earth is in human hands. May we have the foresight and ingenuity to take care of each other and embrace our role as sentinels of the pale blue dot, the only home we’ve ever known.